Immanuel Wallerstein draws on a lifetime of study of long-term historical change to shed light in his newest book on the consequences of the recent, significant turn in US foreign and economic policies. 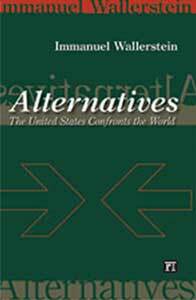 Alternatives shows how the U.S. has been in decline since the 1970s and how these longer trends dovetail with current Bush administration policies, which Wallerstein describes as an attempt to reverse the decline in ways that are disastrous to the future of the country and the world. Wallerstein suggests that a threshold has been crossed that will make it difficult for future presidents to practice the kind of ‘soft’ multilateralism in foreign policy American presidents have used in the past. They will be less able to maintain effective alliances. Wallerstein also shows, surprisingly, why ‘globalization’ already is dead, especially in terms of the United States’ ability to dominate economically in the manner that it has since WWII. He calls for a major revision of U.S. policies – and not an attempt merely to return to the pre-Bush foreign policy. Wallerstein’s visionary book speaks to the challenges the U.S. must face if it is to play a meaningful and progressive role in the world-system.